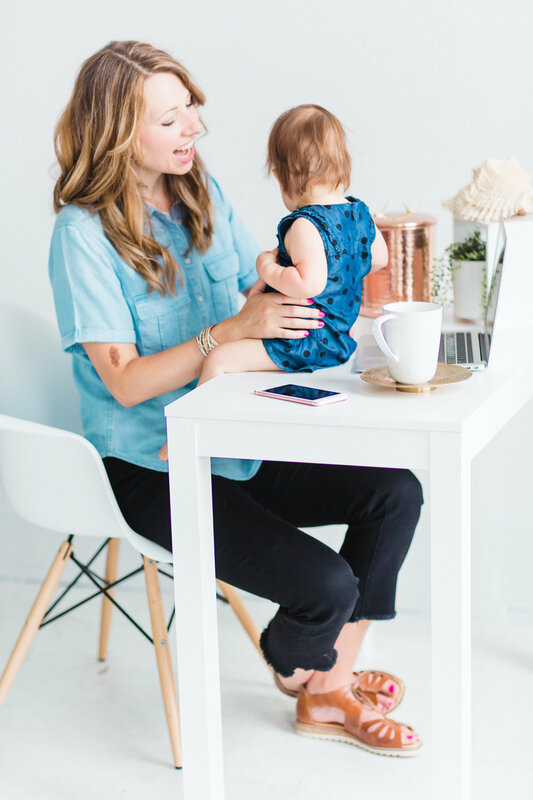 When I wrote a post about how I schedule my work week and how I get it all done as a stay at home mom of a toddler and business owner of a growing, thriving business, the response was overwhelming. I quickly realized how many of you needed guidance for creating your own schedule and finding balance between work and life. I realized that we all want a glimpse of how others are making it work so we can better structure our own lives. I believe that balance does exist and is actually necessary for our sanity and well being. Even though I hear often that balance doesn't exist, I feel that we each have our own version of balance and that we can find it in our lives. It's a process that we're all constantly living in and adjusting to in different seasons. Because of this, I was inspired to start this series featuring other busy women and business owners sharing how they manage their schedules and work towards work/life balance. This series features talented and encouraging women like you and a look into what balance looks like for them. The idea is to share a real-life version of balance and how we each have our own variation of it depending on our life and season. Tell us a little bit about yourself and your business or work. I am first and foremost a wife and mom. But after that I wear a few professional hats. I am a chiropractor by trade and training, but left practice to stay at home with our daughter. Now I run a virtual health business called Just Enjoy Health. Overall, I love teaching women about natural health and simplifying the overwhelming world of health for busy women. I do that through teaching on my website, my podcast: The Just Enjoy Health podcast, and through sharing my favorite methods and products to get healthy and fall in love with natural health for a lifetime. I often laugh because my business is also my hobby and also my degree and also something we do all the time. I love health and it makes me so happy when people embrace a healthy lifestyle and it really clicks why they are doing it and the big picture to why health matters. It changes how people live their lives and the health of their children too. That inspires me to keep teaching and sharing. Take us through your typical day and your main daily responsibilities. Each day looks different for me and I don't know that I have one typical day around here. And that's exactly how my husband and I have decided works best to fit my business into our life and family. I do have some main principles I follow for my business that seems to work for us in our current season. My goal is to work somewhere between 10-15 hours per week. I always feel like I could use more time, but I love how at the end of the day, that is where the balance lies with us. I have one main work day per week and it falls on a Wednesday. I try and get as much focused work done that day as I can and it usually amounts to about half of my work hours for the week done. I really buckle down and focus during this day, realizing larger chunks of work time are only possible Wednesday's. We have childcare for our daughter on Wednesday's too. That's the only way I can get all that work completed. The rest of my work hours usually happen during nap time. I try and not work at every nap time because I really like to have at least one week day a week devoted to resting or getting things done around the house. Otherwise, it's time to get to work and my goal is to get 2 hours of work in during nap time. This has to stay flexible because of a little one's sleep schedule. I can't hold too tight to a to do list or schedule or else I end up being frustrated. What gets done during nap time is what I can accomplish during the time I actually have to work that day. I know a lot of women love to work in the early morning hours and get work done before the rest of the household wakes up. And as much as that works for some, I have learned it doesn't work for me. I wish it did, but I use my mornings as no work time and a time to get some things done around the house and prepare for the day as much as I can. I get my Bible Time/ Quiet Time in, sometimes exercise, sometimes prep dinner, and get myself ready for the day and for my daughter to wake up. When I worked in the early morning hours, I realized that I started my mind on work too early and couldn't quite stop it for the rest of the morning until I could get back to it at nap time. And that wasn't fair for my daughter and left me feeling distracted. The times when my daughter is awake, I don't work. Yes, I'll answer an occasional text and sometimes Instagram something we are doing. But that is the exception during her wake times. That is when I am fully mom and wife and homemaker and I love that time. How do you manage your schedule? I manage my schedule a couple of ways. Mostly through iCal with shared calendars with my husband. We each have a personal one, one for church, and I have a business calendar. That way we can see what we have going on throughout our week and month. For the daily things, I am a pen and paper girl. I love to write something down and be able to see it throughout my day, edit where needed, and cross things out. There are so many wonderful planners out there, but I've learned the thing I love the most is an oversized note card for each day. I make one most days and can get some thoughts out of my brain and on paper so I can see the day ahead of me. It's not fancy, but it works so well for me! What is one thing you always make time for? We always make time for family time and our health and making healthy lifestyle choices. How do you find rest? A nice hot bath is where I find the most personal rest. It gives me time to think, recharge my introverted battery, and relax. I love it, especially because I can fit it into every day and don't need to leave the house! I also recharge with a good TV show or movie. I used to feel like TV can't be recharging. I shouldn't watch it or something was wrong with me wanting to. I've learned that it's my perspective on TV that matters. If I'm using it to escape and can't stop watching episode after episode, that's not even real rest. But, a good show with my hubby at the end of the night is one of our favorite things to do! How do you find the balance between work and home? I think I'm always reevaluating this one. What season are we in? What are our family needs? What are my business needs? What are my personal needs? And that shapes what balance looks like. Tell us one thing that you have learned about finding balance in your life. I used to want perfectly planned out days that were all consistent and fit family and business into their own categories with no overlap and would just work that way regardless. Nope! Life is always changing and I feel in way more harmony realizing that and embracing that. We are in a season of raising littles and growing our family. There's nothing that can be planned long term in this season. There are different needs in pregnancy, with maternity leave, with a little one skipping a nap (and meaning I skip my work time). It is just part of this season of life. I want to learn to find joy in the disruptions, develop a good attitude and outlook, and embrace the beautiful imperfection that is life. I could be super grouchy all the time that something doesn't go do plan. Or else I can learn from it, adjust, and see all the amazing things that interruptions bring to my life. I have learned that my daughter looks at life with so much joy and when I stop and take the time to see things how she does, it's so much more fun! Those are the sweet, sweet moments of life. And work will get done with a little shifting here and there. It always does! What is one piece of advice you would give readers about finding their own balance? The first place to start is to define balance for you. What does it look like? What does it feel like? What is God calling you specifically to in this season? My balance looks differently than yours. How much I'm home and the hours I work in my business are very specific to our family goals and how we want to raise our children. It's ok to try something and realize you need to mix it up again. Remain flexible, remain open to change. Finding balance doesn't mean I have it all together, everything is so perfectly planned out, and I never feel stressed with the day ahead of me. It means I make time for the things that are important to me, say no to what isn't, and try my best to look back at the past week and say "that felt balanced". Sometimes I look at the pervious week and think "there are definitely some things that need to be changed". Does Your Business Have Core Strength?